Your sitting position is more upright and natural. You aren’t supporting your weight on your hands, and your fingers don’t get numb. You can crank pretty hard on the pedals by pulling back on the handlebar. You can climb a steep hill without standing on your pedals. You ride an inch or two lower than a normal bike, which allows you to put your foot flat on the ground when you stop. That helps avoid tipping the bike when you’re carrying a heavy load. To heighten visibility during our gloomy Seattle days, I’ve added CatEye headlights and tail lights and Down Low Glow light sticks to increase visibility from the sides. The final result is pretty expensive for a bike (around $5K), but cheap for a second car. I use it for errands, carting our kids up and down the hill to our local school, grocery shopping, going to the YMCA… well, you get the point. It’s a lot more fun than driving our mini-van around the neighborhood, but our bike lanes are nothing to brag about, so you have to be cautious as well. I never ride without the lights on. One thing that is becoming more apparent to me, is that I need to do more to prepare for peak oil and big bucks for gasoline. To be honest, though, I’m a little intimidated when you say you’ve spent almost $5K on your bike. I wonder if you’ve done a spreadsheet of any type with gas at various prices to determine what the payback time is for a bike. That is my next exercise, to look at the $$ we spend on gas now for a pick-up and a mini-van and determine what the trade-offs for a bike, hybrid, electric, or other would be. I don’t think Tim’s concerns are unusual. The cost and the technology are still barriers for a lot of people. I’ve done a lot of web searches that show interest in cargo bikes peaked about a year ago, when $3 gas was still somewhat shocking. Now that the price has backed off a bit and we’ve become accustomed to that price, the interest in cargo bikes seems to have waned as well. Most of the blogs I’ve found have a flurry of comments in 2008, somewhat less in 2009, and almost nothing in the first half of 2010. If you approach this from a standpoint of pure economics, it’s not easy to compete with infrastructure and culture that is so optimized for cars (in the U.S., at least). This is partly because gasoline is incredibly cheap for the amount of energy it delivers. A gallon of gas weighs about the same as my bike’s battery, but it delivers 100 times more power. Of course, gas wouldn’t be such a good deal if we factored in the costs to our environment (air pollution, carbon emissions, and oil spills) as well as national security. But let’s play with the numbers we have. I’m currently riding about 1000 miles per year on this bike. As I’ve said before, those are tough miles for a bike or a car — mostly short trips up and down steep hills. At this pace, I have to charge my battery about 3 times per week. It holds 355 Wh of electricity. At about 9 cents per kilowatt-hour, that’s roughly 3 cents per charge — less than a dime per week. To do the same errands in our mini-van would take about 60 gallons of gas for the year. That’s only $200 worth of gas at today’s prices, so I’m not going to recoup the $5000 cost of the bike and motor any time soon from savings at the pump. However, I’ve saved money other places. The bike has allowed us to avoid buying a second car. Obviously, the savings are significant compared to the price of a used car, taxes, insurance, maintenance, and repairs. But the main beneficiary is my conscience. Showing my kids that there is a better way to transport ourselves without burning their natural resources at an unsustainable rate — that feels good. I also see my neighbors more often, and I’ve had more opportunities to talk to people without the tinted windshield between us. Most surprising, the bike saves time when traffic gets snarled around our neighborhood during school pick-up and drop-off hours. The popularity of alternatives like this bike will increase as battery technology improves. It makes so much sense to move just what you need, rather than pushing a ton of extra metal around when it isn’t necessary much of the time. As it becomes easier, cheaper, and more reliable, this kind of personal transportation will become more common. In the meantime, I’m peeking into the future and enjoying the ride. P.S. If you’re getting ready to take the next step in your own cargo bike adventure, you should check out this web site: http://www.chrismartenson.com/quiet-revolution-bicycles-recapturing-role-utilitarian-people-movers-part-ii. The author does a great job of describing all the options with lists of pros and cons and photos. You’ll find some less expensive alternatives to my bike. I’m just glad I don’t have to write all that myself! In my last post, I wrote about a few of the implications of riding my electric cargo bike from a financial and social point of view. Today I’ll tackle another topic that I’ve been pondering: how much extra time do my cargo bike errands cost? My first errand under the stopwatch was picking my kids up after school. As sometimes happens, I was late leaving our house, so I had to literally sprint the half mile up the hill to the school. When I pulled into the parking lot, I was surprised to see that I had done it in 2 minutes! Sure, I had cranked those pedals pretty hard, but you can keep up a pretty good effort for an interval that short. While it’s true that I could get there a little faster in a car (possibly even a minute faster), I would spend much longer waiting to get through the traffic jam in the parking lot, so the bike wins this contest easily. For my next errand, I needed to pick up a few items for dinner from the closest grocery store. The route winds through neighborhood streets for 1.7 miles, descending about 500 feet. The bicycle route tool in Google Maps says it should take about 8 minutes; it actually took me 9 (I got stuck at a red light for a long time). I spent 11 minutes finding my groceries in the store, and then I pedaled back up the hill in 9 minutes (no significant traffic light delays in this direction). So, my total errand time was 29 minutes. To compare, I jumped in our mini-van as soon as I got home so I could measure the same errand in the car with the same traffic conditions. I got to the store in 6.5 minutes, and the return trip took 7.5 minutes. The total errand time would have been 25 minutes. Although the car would have saved me 4 minutes, this was really a best-case scenario for the car. There was very little traffic at this time of day, and there were plenty of parking spots. Many times I spend several minutes looking for a place to park. To be fair, there are many errands in the 5 or 10 mile range where the car is much more efficient time-wise, especially if the route uses a freeway outside of rush hour. If you’re thinking about buying a cargo bike, you will have to determine whether the kinds of errands you do make this feasible for you. The terrain is also a factor. Google estimates that my return trip from the grocery store should have taken more than twice the time it did. Without the electric motor, the time and effort would force me back into the mini-van on many days. I really can’t imagine using this bike without some kind of assistance on these hills. The title of this post might be a tad premature, but today I’m feeling a little more optimistic than I have in recent weeks. That’s partly due to encouragement from my readers (you are a wonderful bunch!) And perhaps some of the credit goes to a break in our Seattle rain that is allowing work to proceed on the solar panels being installed on my roof this week (soon I will be motoring up the hill using electrons harvested very locally). First, customers will no longer have to build these bikes themselves. That requires either mechanical ability or a good bike mechanic and some extra cash. But the process isn’t streamlined: which motor do you use? Where do you mount the battery? Are the specs on the motor a good match for the loads on the bike? I’ve read several blogs where the build process took months to complete. One can assume that the bike manufacturers have matched an appropriate motor to the bike. If there are issues with the bike, there is a single contact, rather than wondering if the problem lies with the bike, the motor, or the installer. To date, electric cargo bikes have been one-off custom builds, and there is no easy way to leverage knowledge or share solutions. Economies of scale will reduce prices (both of the new bikes are significantly less expensive than mine), and competition will keep those prices within reach of people who need an alternative to a car for financial reasons. Price $2,599 $2,297 (includes tax and shipping!) $3,887 = $1,997 (bike) + $1,890 (BionX)bags/runners/deck not incl. When I originally wrote this article, I included a row in the table above listing the carrying capacity of each bike. Since then, I have become concerned about the ability of cargo bike brakes to stop loads that approach the carrying limits of the bike. Yuba has actually removed any mention of carrying capacity from its website. In my opinion, that is the responsible thing to do. There is already a tendency for enthusiastic cargo bike promoters to put very large loads on these bikes and post photos for bragging rights. Even though it’s fun, I don’t think it’s in the long-term interest of cargo biking to promote unrealistic or unsafe behavior. Since I wrote this article, there have been further developments for the Ute and elMundo, and there is a new bike coming from Trek. You can read about them here. Regular readers of my blog know that I have been worried about cargo bike brakes for the past several months. Yesterday my wife and kids left for a multi-day camping trip, and I decided this would be the perfect time to do some braking experiments with a loaded cargo bike. In my mind, there are two kinds of braking I’m asking my bike to do: long, steady descents where I just need to keep my speed in check, and quick emergency stops. I have a lot of experience with the former category – practically every weekday I pick up my kids from the school at the top of our hill and carry them down the steep slope. On the other hand, I’ve only made a couple of emergency stops during the past year, so I haven’t been as confident in the ability of my brakes to stop a heavy load. 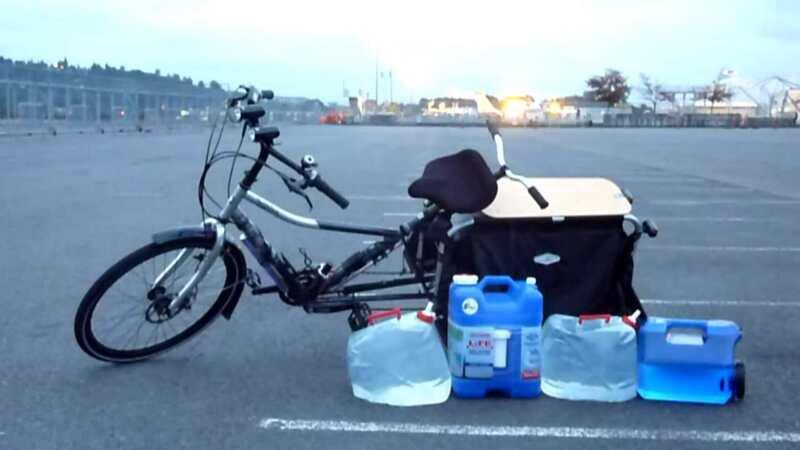 This morning before dawn, I loaded our mini-van with the bike and containers of water weighing a total of 180 pounds. My destination was the parking lot behind the Seattle Museum of Flight. I was looking for a long stretch of flat pavement that would allow me space to accelerate and skid to a stop. And now I’ll cut to the chase. When it comes to the Hammer Truck’s emergency stopping power, the big news is that there is no big news. The bike stopped a combined weight of 420 pounds (180 pounds of water, 160 pounds of me, and 80 pounds of bike) travelling at 20 miles per hour, and it brought me to a complete halt in about the width of a parking space (less than 10 feet). That wasn’t significantly longer than the stopping distance for the unloaded bike. For that matter, it was on par with the stopping performance of our mini-van, and that’s comforting given the frequency I have to ride in mixed traffic. However, I caught the unmistakable whiff of hot brakes and skidding rubber with the increased load. The brakes were definitely working harder, even though they still felt solidly in control. With considerable relief and bolstered confidence, I decided to repeat the experiment on a patch of wet pavement that had been moistened by the museum’s sprinklers. That turned out to be a mistake. The tires locked and I went into an uncontrolled skid, followed by an awkward low-speed crash. I ended up on the ground, chain torn off the crank, and front wheel turned backwards. Fortunately, neither bike nor rider was injured (but I was grateful there were no spectators at that hour of the morning). This won’t come as a surprise to experienced cyclists. Braking on wet pavement is a completely different story, and adding a heavy and somewhat badly-balanced load makes things even worse. Perhaps I haven’t given slick pavement the caution it deserves during our damp Seattle winter – now I will. How applicable are my results to cargo bikes in general? My concerns about emergency braking have been mostly mitigated by these experiments, but with disc brakes on both wheels and the BionX motor assisting with regenerative braking, my bike is probably near the top of the class. It’s possible that less favorable results would occur if you tried to stop a heavier load travelling faster with less capable brakes. Don’t let my unscientific results make you over-confident in your brakes. I recommend doing your own experiments to give your equipment the opportunity to earn your trust. 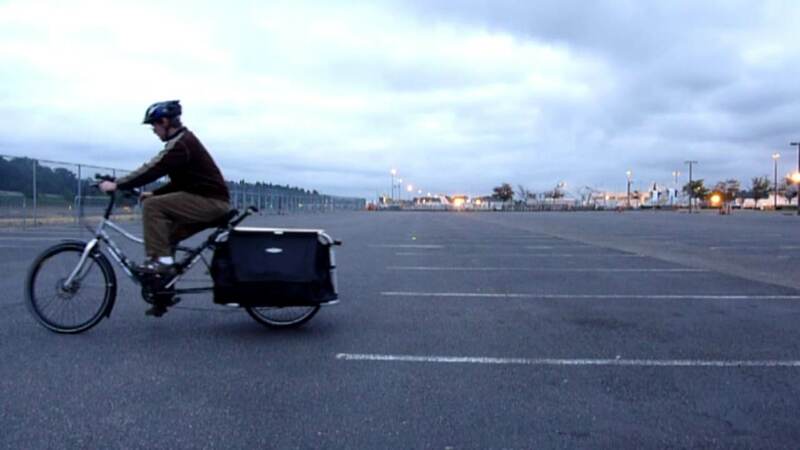 This month marks the one-year anniversary of my cargo bike and my blog. What an interesting year it has been! I realize I’ve already made that point in several recent blog posts, so I won’t repeat myself here. But I will take just a moment to marvel at the timing of this: shortly after I returned to Seattle following a year of positive biking experiences in Copenhagen, and after deciding the only way to approximate that lifestyle here is with a little electric assistance, multiple manufacturers decided to offer motors on their cargo bikes. The timing couldn’t have been better to enable me to contribute something to this movement. The title of today’s post (“Looking back, cranking forward”) reflects my desire to reflect on this past year. But it also describes the maneuver I perform on my bike when I want to change lanes or direction, and that’s a pretty good metaphor for my intentions regarding this blogging project. When I started, my main goal was to demonstrate the possibilities of this type of transportation. As more bikes came on the market, I started comparing their features. Then I wrote a few cautionary articles about potential pitfalls and limitations, trying to balance the inevitable marketing hype with a small dose of reality. Now I’m approaching a decision point. With bigger companies starting to pay attention to cargo bikes, the efforts of a part-time cargo biker may not matter so much. People with bigger megaphones and larger marketing budgets will shape perceptions of cargo biking. Professional staff employed by biking magazines will begin to review these bikes, and I can shift my focus to other things. At least, this is my hope. If we aren’t on the verge of this scenario, cargo biking may remain a small niche of enthusiasts. I’ve enumerated some of the reasons this could happen: lack of infrastructure, safety concerns, practical issues with weather/clothing/hair, or maybe just the larger size and higher price of these bikes. Even the price of gas figures into the general popularity of biking. The crystal ball is still cloudy. Nonetheless, there are some interesting developments. For example, check out this marketing video from Trek. 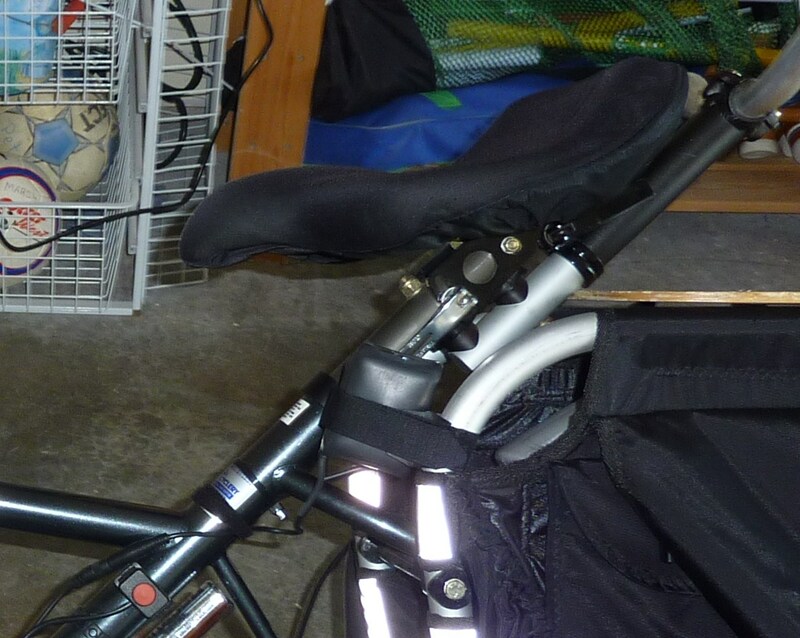 It presents biking in a light that might not be familiar to modern Americans. An attractive young woman enjoys doing her errands (buying vegetables and gardening tools from her neighborhood co-op) on her cargo bike at a relaxed pace in a nice suburban setting. (Did you watch that? The soundtrack, visuals, and punch line are pretty good! :-)) Granted, this video is promoting a bicycle race, but that’s my point. Many Americans think of Lance Armstrong and Tour de France when they think of biking, not going to pick up their groceries. We’re gradually changing that perception, but it hasn’t happened overnight, and it probably won’t. I’ve been waiting to see more detailed reviews of electric cargo bikes by professional magazines or web sites. Until they materialize, I’ve tried to fill the void with my own mini-reviews, but I can’t afford to buy bikes just to try them, and no manufacturer has offered to loan me one to demo. I can’t say I’m surprised – if they wanted to loan a bike out for review, they would probably choose a professional reviewer with known technical and writing chops. Although I’m still waiting for those electric cargo bike reviews, I was pleased to see the first detailed review of the Rans Hammer Truck (but no motor added) a few weeks ago on the BikeCommuters.com web site. It’s nice to see a cargo bike critiqued by someone who is knowledgeable about cargo bikes and bicycle components. While I’m on the topic of the Hammer Truck, I found this article about how to haul heavy loads with it (by Rans founder Randy Schlitter). I thought it was noteworthy that he mentions the dangers of transporting heavy loads downhill – on a bike equipped with both front and rear disc brakes! Most manufacturers are content to provide a single disc brake. Randy mentions other possible points of failure with a degree of candor that I heartily applaud. I recommend reading the article even if you aren’t considering a Hammer Truck as a potential ride. Midway through the year, I projected that I would ride my cargo bike approximately 1,000 miles by its first birthday. The actual number appears to be somewhat less: a bit shy of 700 miles. Two things happened that cut my daily mileage: summer (we traveled a lot and I used the mini-van to transport kids to various activities) and a new exercise schedule (my wife and I drive to the local YMCA at 5:00 in the morning instead of me biking over by myself). However, even though we’re driving the mini-van more than I would like, we cut our annual gasoline bill in half compared to the year before we went to Denmark. That’s partly because we have one less car now and my wife commutes to work by bike and bus. On the other hand, this year we needed to drive our daughter to many far-flung locations for gymnastics practice and competitions. Although the cargo bike isn’t the only factor reducing our gas usage, it is an important part of the program. Although I may have hinted about our goals in previous blog posts, I don’t see any harm in being explicit about it. During this past year, my family has taken numerous steps to reduce our energy consumption and carbon emissions. We simply think it is wise to live in better balance with our planet and the creatures which need it. A less impactful lifestyle will benefit our country, our environment, and our children. Last May we installed solar panels on our roof. During the sunny summer months they have produced more than 3 megawatt-hours of electricity – twice what we normally use during that period (the extra electrons flowed into the grid and were shared with our neighbors). But now the sun is going south, the days are getting shorter, and the clouds are returning. Our electricity production will fall below our needs this month for sure. Federal and local tax incentives make our solar project financially feasible at our northern latitude, but just barely. Even with production credits, it will take us approximately 15 years to recover the investment, unless electricity rates climb significantly during the coming decade. So we’re not doing it just for the money. In these few months, the solar panels have saved the equivalent of nearly 3 tons of carbon dioxide. That feels nice, but most of our electricity comes from hydro-electric and wind power, so the savings may be more theoretical than actual. In any case, we wanted to support these nascent solar technologies so that the companies can survive and improve until solar power is a no-brainer for people around the country. The next step in our program is to eliminate mini-van usage completely for daily errands. We’re planning to lease a Nissan Leaf all-electric car for about $350/month. Since we spend about $200/month on gas, the real cost of the lease will be about $175-$200/month, but then there’s car insurance and maintenance costs. No matter how we rationalize it, cars are expensive to operate. In comparison, the total bill for maintenance, improvements, and electricity to power my bike was less than $200 for the entire year. Back to the main topic of this blog. As I review the articles that I’ve posted this year, I’m pleasantly surprised with the quantity of information I’ve been able to convey. Hopefully the quality of my posts was commensurate with that effort. Although I can now see the light at the end of the tunnel, I don’t think the project will be complete until I get to ride the Transport+ bike from Trek, which I’m hoping will debut in my area next month. After that, I’m not sure. Writing a quality blog is interesting, somewhat addictive, and time-consuming. I’m open to suggestions, if you think there are topics that aren’t being covered elsewhere. An eventful year has passed since my first New Year status report. A lot has happened in my life and the cargo biking scene that would have strained my imagination last January. And a few things didn’t happen that I confidently anticipated. I would be thrilled to repeat last year’s progress in 2011, but I’ll try to avoid making any bold and probably inaccurate predictions and instead focus on recent events. After a flurry of announcements in early fall, there has been little news from cargo bike manufacturers during the past couple of months. Perhaps they think that most Americans aren’t looking for new bikes when so many states are buried in snow. While that seems like a reasonable assumption, my blog has seen no seasonal decrease in interest. On the contrary, every month of 2010 saw significant increases in readership, with literally thousands of unique visitors in December alone. And that was despite the fact that I posted no new articles in December and only two short articles early in November! On the bright side, 2010 saw the release of two electric cargo bikes (the Ute and elMundo) and the announcement of three more (the Transport+, several models from Onya cycles, and Urban Arrow). Waiting for availability of these latter bikes has required considerable patience. Despite my frequent criticism, Trek’s web site still claims the Transport+ will be available in late fall (they don’t mention which year!). Hey, Trek, is there anyone awake over there? Some features and prices have evolved since my earlier reviews of the Ute, elMundo, and Transport+. All of these bikes now sell for about $2600, so they must now be evaluated on features (and availability) rather than price. I am pleased to see continued evolution of the elMundo, both in the bike’s features (like the rear disc brake) and the increasing accuracy of the specs published on their web site. For example, I complained in an earlier article that the power rating of their motor seemed inflated, and now it’s fixed. Thanks, Yuba! This is a point that I hadn’t considered before. In the past, I’ve worried about braking performance of loaded cargo bikes, and I found that increased load seems to also increase the braking performance of the tires (at least, on dry pavement). The performance of an unloaded tire is therefore of some concern, especially for people riding on steep hills. I’m optimistic that the Urban Arrow will be a good bike for relatively flat terrain; I will be quite interested to see how it performs in our neighborhood. My Hammer Truck continues to work beautifully. But ironically, it’s not getting much use right now. I used to have a great biking circuit: I would bike with the kids to school, then bike to the Y for a workout, pick up groceries on the way home, and bike back to school to pick the kids up in the afternoon. However, my daughter now rides the bus to her new school, and my son likes to walk with his friends to school. My wife joined the Y, and now we drive there together at 5:00 in the morning. My son joined a gymnastics club which is a 30-minute commute by car, so I pick up groceries on the way home from taking him. With these changes to our family schedule, I have to invent opportunities to ride the bike, and there isn’t much incentive to do that in the wet winter weather of the Pacific Northwest. When I do get the chance, it feels quite luxurious, and increases my nostalgia for the lifestyle we had in Copenhagen. Some days I spend 2 or 3 hours in the car – a nightmare! We bought a used Prius to increase our gas mileage while we await the arrival of our electric Leaf (perhaps as much as 5 months from now), but I’m discouraged that the layout of our city and the demands of our busy lives make it so difficult to pursue bike-centered transportation. Speaking of transporting kids, I was recently introduced to a wonderful blog focused on carrying children on bikes: http://totcycle.com. The blog includes a great survey of the options, and it’s broader in scope than anything I’ve written on this subject because it includes non-electric alternatives. If you have young ones, check it out. The photos of kids napping on various bicycle configurations is heartwarming. I only wish I had started biking when my kids were younger. I recently read an interview with an oil industry analyst who thinks we will see $5/gallon gas in the U.S. by 2012. He thinks this is possible not because of any near-term shortage of oil, but due to fear of shortages as the world’s economies recover. If this turns out to be true, the timing isn’t great. Expensive fuel will either inhibit the long-awaited economic recovery, or it will spur inflation if our economy manages to power through it. If there’s a bright side to this prediction, the price of gas is probably the most significant factor in determining how many bicyclists there are on U.S. streets. However, I would rather see people choose bikes for all their benefits rather than because they have a financial gun to their heads. But no matter how it happens, bicycles will play an increasing role in our transportation options. For solo riders with relatively short commutes, a bicycle just makes too much sense from the standpoint of energy expended per mile traveled. And because electric assistance extends the range and lowers the effort for a broader section of our community, it really is possible to see bikes in numbers we’ve never seen in modern America. I said I wouldn’t make predictions, but if 2011 isn’t the year of the electric bike, no one will be more surprised than I.